They don't belong in our houses. They belong outdoors. Their huge claws are great for climbing trees. Not so great on skin. They enjoy 90 degree temperatures and 90 percent humidity. They love to bask in the sun. Lamps and humidifiers don't' cut it in an Ohio winter. The saddest thing is to see Fio sitting on a heating pad looking out a window at snow. Their teeth are razors. Their long tails are scimitars. When the males go into season (about a third of the year) the world becomes their enemy, now matter how good-natured they are the rest of the time. They either want to fight or mate with everything, including you and your clothing. Be prepared with tooth marks where you would rather not have them. They don't want to live in cages. They need a lot of room since they get really big- up to 6 feet long and 20 pounds. 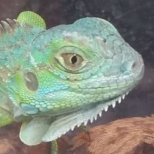 Buying a cute little baby iguana is like buying a cute little baby dragon. Before you know it, its as big as your house and breathing fire. 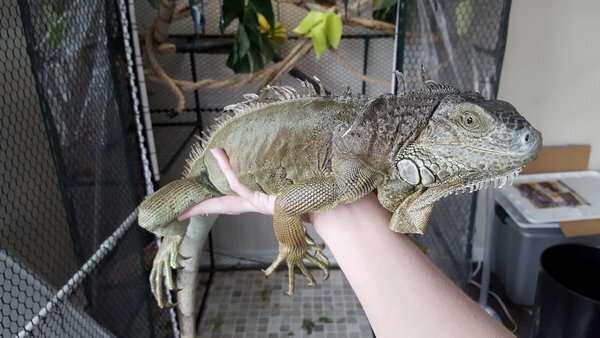 Even the reptile rescue where FIo originated has a no-iguana policy unless they are delivered by another organization. We think Fio was abandoned in an apartment and delivered to a humane society. One of the lucky ones. 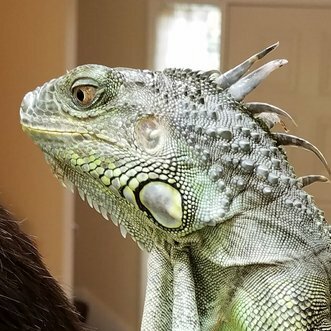 So why would there be a trade in iguanas? 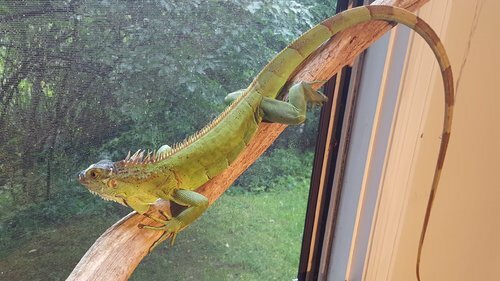 Please, reptile breeders and reptile lovers everywhere, let's stop trying to make iguanas into pets!